For those who love spelling and all things grammar, "Words With Friends" might prove to be the perfect match-making option. 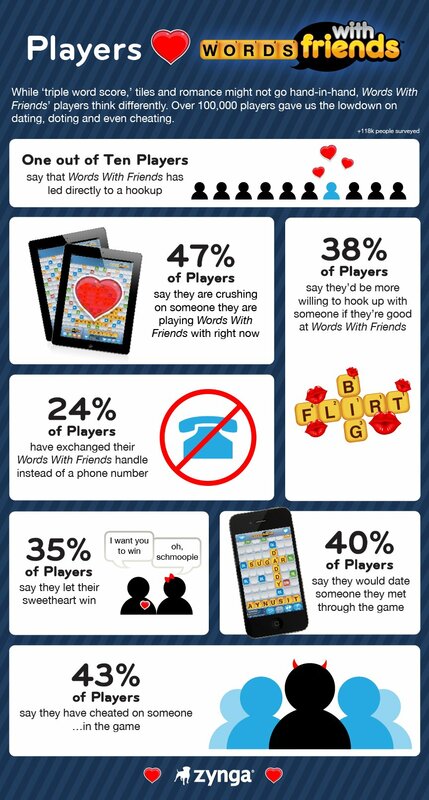 A poll conducted by Zynga, maker of the popular Scrabble-like gaming application, revealed that one in every 10 players have hooked up with an opponent, and 47 percent of players report they're "crushing" on someone with whom they're competing. Trish and Dave Palmer started their romance after Trish lost a game and challenged Dave to a rematch, the Wall Street Journal reports. The couple exchanged several messages and their romance soon escalated to a nearly two-year courtship before they tied the knot last November. Much like the Palmers, Megan Lawless and Jasper Jasperse began their overseas romance after meeting through the random opponent function in 2009, according to Red Eye Chicago. After a series of emails and video chats, the couple decided to meet in person. Jasperse eventually moved from the Netherlands to the U.S., and the couple married in July. Some might say the new-age romances are a matter of luck, but "Words With Friends" co-creator Paul Bettner credits the matches to something more powerful. "It's like the purest version of fate," Bettner told the Wall Street Journal. "When two people meet, it's that they've hit that button at the exact same moment in time." In addition to being responsible for a handful of romances, the game is also responsible for saving the life of at least one man. Beth Legler began playing the game with Georgie and Simon Fletcher from Queensland, Australia. During the match, Georgie mentioned Simon wasn't feeling well and described his symptoms to their random opponent. Legler, who's married to a doctor, relayed the information to her husband, who suggested the Fletchers head to the hospital. It turns out Simon had 99 percentage blockage near his heart, and the Leglers quick thinking saved his life. "It was almost like I was meant to, you know, pick Beth as a random opponent," Georgie told Ten Queensland News. Zynga formulated the results of its poll in the graphic embedded below and, after analyzing the information, NBC Bay Area offered up a cheeky suggestion: "If you're single on this Valentine's Day, maybe you should be playing."